Do you need something different for your next corporate event, or are you looking for the ultimate St. Augustine beach wedding? Then look no further than RythmTrail! The premier steel drum band in St. Augustine Beach plays the top soca, calypso, reggae and rocking steel drum music and can be reached here with just a click of your mouse or phone call. 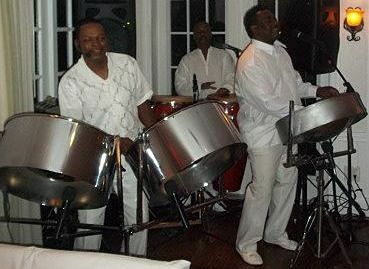 Our native Caribbean island steel drum players have over 20 years of experience, so you know that your party will be rocking to the sweet sounds of the best steel drum band in the state. Whether we have our whole steel drum band play or it’s just one of us for a solo performance, you can bet that RythmTrail Steel Drum Music will make your beach wedding, corporate event or house party one that you and your guests will be talking about for years. Book RythmTrail today for your next event and your party will be whisked away to the tropical islands from the soothing sounds of RythmTrail Steel Drum Band. RythmTrail can provide great steel drum music in St. Augustine Beach as well as all over the state of Florida, nationwide and even internationally. From classy ceremony music for your St. Augustine Beach wedding to a creative and out-of-the-box corporate event, RythmTrail will play all of your favorite songs and they’ll play them anywhere. Create your own musical playlist of songs or let RythmTrail do the work for you and turn your party into an upbeat, romantic or even dramatic theme that will set the mood for the perfect event. Call RythmTrail today at 866-495-4522 or get a free quote online and make your next event into a tropical island getaway. First and foremost, the Steel Drum performer from RythmTrail Steel Drum Band made the day! Absolutely fantastic! It is important to know how and why we wanted a steel drum band. My wife and I attended a surprise birthday party in Virginia. The birthday surprise was taking steel drum lessons, so, his wife, the party thrower got a steel drum player to perform at the function. It was the perfect accompaniment to the party. My wife, after hearing the performer for only minutes declared “I have to have one of those at the rehearsal dinner!” After the party I applied on GigMasters. RythmTrail Steel Drum Band was the first of the five to respond, we listened to all the performers from the competition on their websites and were hooked on RythmTrail Steel Drum Band. We were not disappointed. First, at the party we attended the steel drummer had a single drum, RythmTrail Steel Drum Band drummer had two drums and sang- beautifully. The performer was professional, personal, accommodating and GREAT! Perfect for a sun drenced afternoon, with rows of pelicans flying by and dolphins literally leaping and dancing with the steel drum music. The RythmTrail Steel Drum Band was the exclamation point on a perfect party. The steel drums were the perfect pairing with our Key West themed employee party this spring. Everyone enjoyed the music and danced the night away. Thank you to RythmTrail for helping make our event a memorable one!